Today I had the wonderful opportunity to visit Sint-Ursula School in Horn, Limburg, The Netherlands together with fellow Belgian and Dutch ADEs. This school has been awarded the title Apple Distinguished School recently and has a 4 year history of implementing iPad devices 1:1 to students. Not all students at Sint-Ursula are part of the 1:1-scheme; it is a choice they make. Very important to know is that being part of an “iPad class” does implement much more than just having a device on your desk during the lessons. The emphasis is not on the device but on the way the students are activated during the lessons; technology empowers the students to learn more self-paced and less teacher-driven. Does the student show a positive attitude towards learning? Does the student experience the use of the device as an added value to the learning process? Are test results as good or better than those of their peers that are not part of the project? Do teachers experience an added value? Do parents experience an added value? Teachers, coaches and students all need thorough technology training. Don’t forget TPACK!! 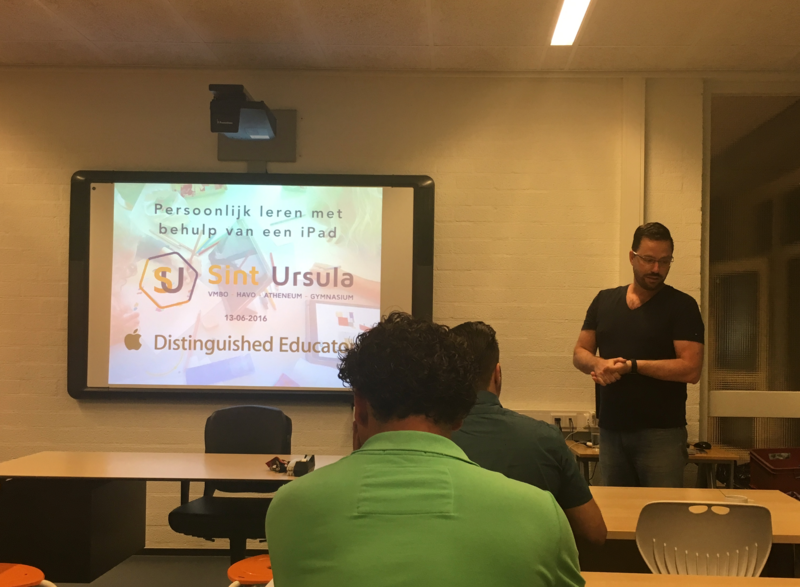 At Sint-Ursula iCoaches help teachers, students and parents with their questions regarding the iPad-project. This group of coaches consists of students and teachers. They are present at school, but also online. Where before all learning took place inside a classroom with desks and chairs in rows, this has changed dramatically, not only inside the classrooms, but also in corridors and the media library. The library has been turned into an open-all-day learning space where collaborative work as well as individual work in silence is promoted. In corridors, individual tables and comfy sofas foster learning outside of the classroom. Inside the classroom, flexible seating and table positioning is applied. In the gym hall, students were practising Shot Put. Students got their instruction from a slowmotion video explaining the technique. Four benches divided the hall and from the center, 4 students threw. All students were in pairs, so the one not throwing was filming the other one with an app called Motion Shot. This app makes analysing the movements very easy. Only the teacher was present in the classroom. His students were on a digital scavenger hunt using a service called seppo. The teacher made a math quiz on geometry with real-life geometry problems hidden around the school where students had to measure corners. On the students device is a map with hotspots indicating where to go and find the questions. All results where send to the teacher in real-time. This was AWESOME! This teacher (I’m so sorry I forgot her name …) made a digital escape room in Google Drive by hiding passphrases in quizzes in a shared folder. In order to open all the documents, students needed to find all passphrases. Such a great idea and such a buzz in the classroom! St udents created a menu for a restaurant in English and passed these around. In a next tasks, they had to write a scenario for a role play and record this conversation. All files where uploaded to a shared Google Drive folder for the teacher to grade the results. This might seem like a daunting task (especially editing and sharing the video) but on the iPad, this is fairly easy. What I learned about this visit is that this school did take a very radical decision in their didactical thinking, but implemented this with a real long term vision. They set their goals and evaluate the project on a regular basis. Also very important is the scale of the project: they started small with only a selected and motivated team of teachers and students. Everyone in this 1:1-project has opted in. But there is a clear evolution towards a bigger part of the school being involved and already a critical mass has been achieved; next school year the project will grow even further. Many thanks to Mark, Vivian and Robin for having us and a big thank you to all the teachers that opened up their classrooms for us today.